The Justice Department, Department of State and Government Accountability Office are looking into three employees affiliated with the Democratic Socialists of America (DSA) after they were featured in a secretly recorded sting video. The video purports to show the employees may have committed ethics violations or used government resources to engage in political activities. . . .
. . . . O’Keefe sent his colleagues to expose a handful of government employees who are involved with the Democratic Socialists of America. An auditor at the Government Accountability Office (GAO), a State Department agency analyst and a former chief of staff at the Centers for Medicare and Medicaid each discussed efforts to “resist” Trump administration policies from within executive agencies. Three of those employees are now under review, according to statements from GAO and the Justice and State Departments. . . .
Dr. Raymond Batvinis is a former FBI counterintelligence official who spent 25 years working in the federal government. He said he does not believe the type of conspiracy O’Keefe claims to expose exists, in part, because it is not feasible. “As a purely practical matter, I just don’t see how it could happen, particularly at the mid-level of government employees,” Batvinis noted. The federal government employs more than 2 million full-time workers across the country and across agencies. Each agency has its own culture and is led by political appointees.”There’s no one individual or tiny cabal or clique of people who are manipulating these things,” Batvinis stressed. . . .
Subramanian, a member of DSA, also suggested he worked to advance DSA’s political agenda while he was on the clock and intentionally misrepresented his involvement in the organization on a government disclosure form. In another video, Allison Hrabar, a paralegal in the Justice Department’s antitrust division, was recorded discussing her involvement with the Democratic Socialists of America (DSA), including how she obtained the home addresses of a Washington lobbyist the group wanted to protest. . . . .
. . . . In one video, Hrabar explains to an undercover Project Veritas reporter that she found Wilely’s home by running his license plates. “We cannot do it officially,” Hrabar said. In a separate clip, she said she used”public information and research” to find the address. 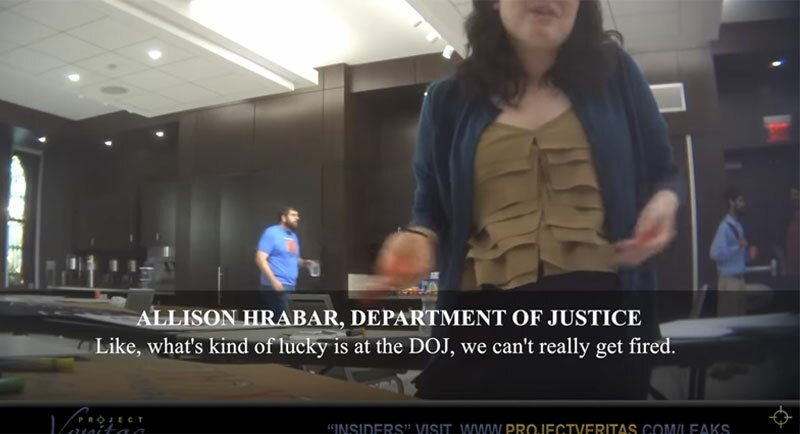 “What’s kind of lucky is at the DOJ, we can’t really get fired,” Hrabar told a Project Veritas reporter. A Justice Department spokesperson called the allegations “deeply concerning.” Justice Department policy “prohibits misuse of government resources to advance personal interests. We are looking into this immediately and have referred this matter to the Inspector General as well,” the spokesperson said. Another video featured Stuart Karaffa, a State Department analyst with the Bureau of Overseas Buildings Operations and according to Project Veritas, a “ranking member” of the Metro DC Democratic Socialists of America. Karaffa admits to drafting emails for DSA while he is at work. He acknowledged he could get in trouble if caught, but told the undercover reporter, “I have nothing to lose. It’s impossible to fire federal employees.” . . .
. . . According to a recent poll, roughly 73 percent of Americans believe there is a “deep state,” described as a group of unelected government and military officials who secret manipulate or direct national policy. Only 5 percent are confident such a structure definitely does not exist.